How to Delete Music from Android Phone/Tablet? Home> Resource> Android Backup> User Guide: How to Delete Music from Android Phone/Tablet Effectively? You have an Android phone or tablet which you have filled with all sorts of song among other audio files? Then after a certain time, you will need to delete music from your Android phone or Tablet since they take up too much space on your device and slow down the device. But during the deleting process, there are problems would arise to obstruct you. And one of the common problems is- it is hard to delete songs permanently from a device. Here, MobiKin Assistant for Android would be a good helper for you. It is a software that can help you to transfer, export, import, delete, backup and manages the applications, contacts, text messages, photos, videos, music and other files in an Android phone or tablet and deals with it in one place on your personal computer. It works with overall Android devices, including Samsung, HTC, Motorola, LG, Sony, Huawei, ZTE, Lenovo, etc. So with the help of this program, you are able to free up your Android phone by exporting songs or deleting unwanted music. Both of operations can be easily completed in this software. - Delete the files: tap on the "Delete" button from the top menu bar to remove the selected songs. - Export the data: click on the "Export" button from the menu to sync the selected files to computer and then delete them on your phone. How to Delete Contacts on HTC One M8/M9? How to Delete Android Photos in One Click? Step 1: Unlock and open your Android device, select the "Menu" icon, then find and open the "Settings" option. Step 2: From the "Settings" option, select the "SD card and phone storage" option and click "Unmount SD card". Step 3: Now you can slide the back cover and safely remove the SD card from your Android device. Then insert the SD card into an SD card reader and connect it to the computer. Once detected by the computer, you can double-click the icon of the SD card/removable disk displayed in the lower right corner of the PC window. Step 4: Once opened, you can browse all the folders stored on the SD card until you find the folder where the music files are stored. In general, the folder is named "Music". Step 5: Open the Music folder, select all the music files you want to delete and move them to the trash. If you want to permanently delete them without recovery, you can choose to empty the recycle bin, then these music files will disappear permanently. We know that every Android phone is now basically equipped with the Google Play Music App. With this app, you can easily find all the songs stored on your device. In this section, we'll show you how to use the Google Play Music app to delete all songs on your Android phone. Step 1. First open your Android device and launch the Google Play Music app. Step 2. Click on the "Music Library" option in the upper left corner of the application interface screen to view the application's menu panel. Select "My Library" and your music list will be displayed. Step 3. Now select the track you want to delete and click on the menu icon on the side of the selected track. Step 4. Finally, click on "Delete" from the context menu. That's it! Your song will be removed from your Android device. Now, you can repeat the above steps to delete other tracks. Of course, you can also select the tracks in one thread and delete them altogether by tapping the "Trash" icon. Note: What you need to know is that by deleting the music files in your Android phone by the above method, any expert hacker can use some file recovery tools to retrieve the deleted Android music files. 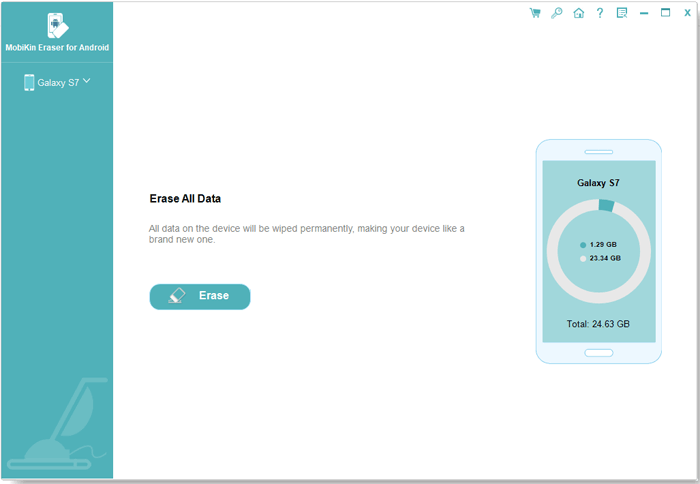 If you want to permanently delete music files from your Android phone, you need a third-party Android data erasing tool. This will be covered in detail in the fourth part. 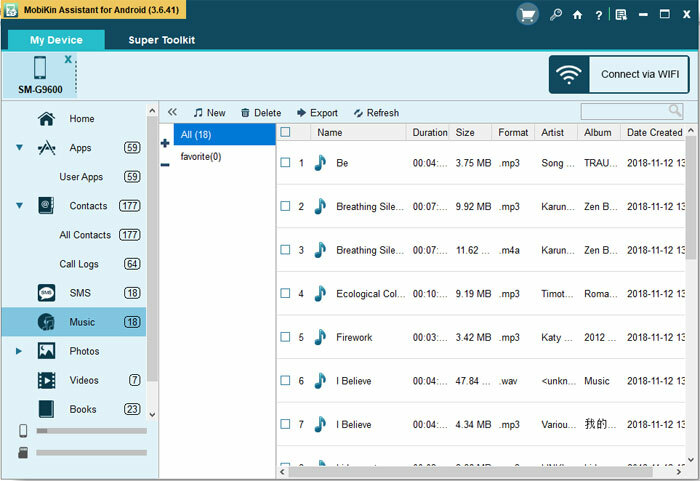 Some users may want to use a cleaning software to directly remove the unwanted songs so here, we would like to suggest you to use the Android Data Eraser. 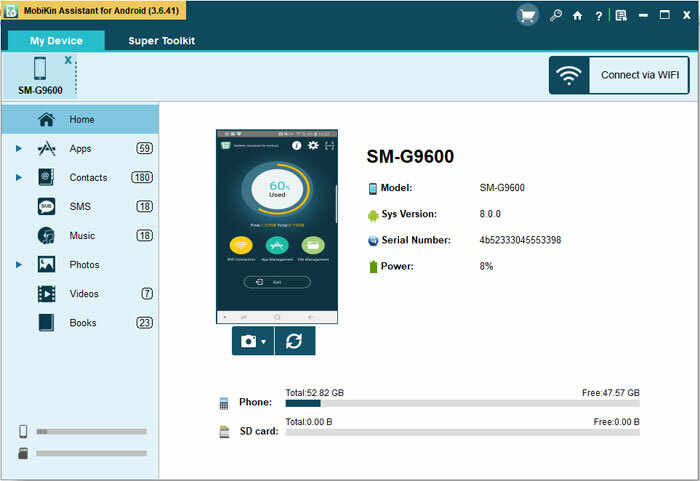 As its name suggests, this is a professional software to clean the Android phones like Samsung, Huawei, LG, HTC, Motorola, etc. 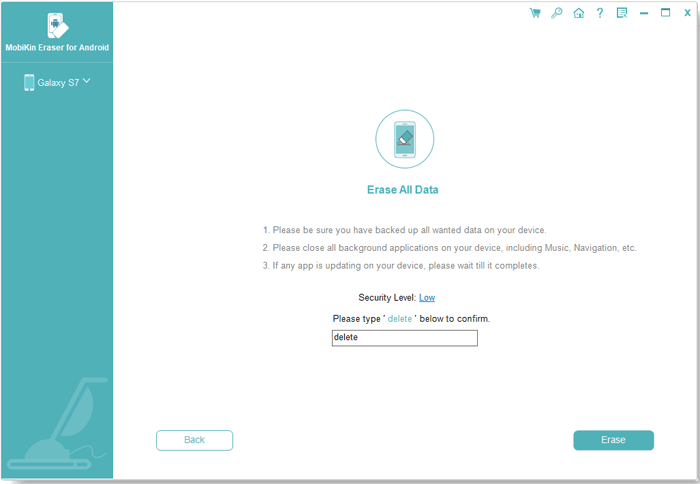 The highlight of this software is that it can permanently wipe the data on your Android phone. In other words, all the files that are erased by this tool won't be restorable. At present, this software only supports to erase all data for Android devices. So please backup your Android files before deleting the data or you will lose all the files permanently. First of all, you need to download the software by clicking the icon below and then go with the instructions to properly install it. 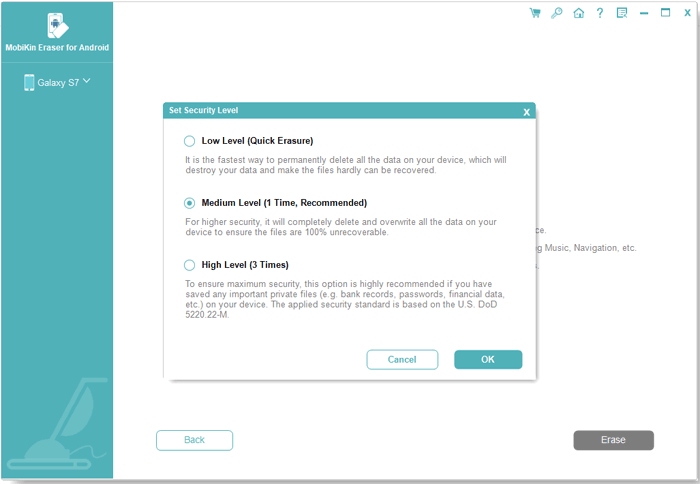 When the software detects your Android device successfully, you can click "Erase" button on the main interface and then tap on "Medium" to choose a security level according to your need. Finally, just type "delete" in the "Erase All Data" interface and click the "Erase" button located at the bottom right corner. Then all the files on Android, including the songs, will be removed from your Android phone immediately. All the options above are helpful to clean the Android music but I think the assistant software would be better here cause it won't affect other files on your phone and you can also manage other data like photos, videos, messages, etc. with it. Anyway, just choose the one you like to delete music from your Android phone or Tablet so you can better enjoy the device. How to Edit Samsung Contacts on PC or Mac? How to Export Android Phone Contacts to Excel? Android Sync Manager- How to Transfer Data on Android Phone to PC? How to Sync Music to Android Easily? How to Download Music from Pandora on Android Phone?